A renewal of democracy should be the means to cleanse Latin America of its history of corruption and abuses of power. But as the Mexican case shows, unless democracy is extended by enhancing civil society, its promise will not be realised. 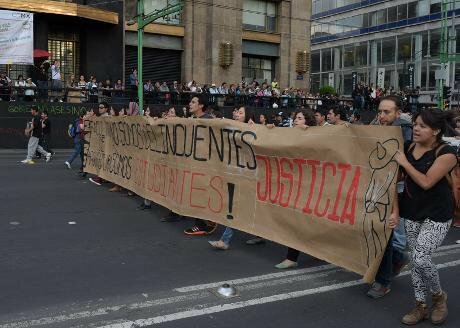 Turning point: a protest in Mexico City after the student disappearances. Demotix / Enrique Perez Huerta. All rights reserved. In July 2000, the National Action Party (PAN, in Spanish Partido Accion Nacional) finally won the presidential election which ended the 71-year rule over Mexico by the Institutional Revolutionary Party (PRI, Partido Revolucionario Institucional). There was hope, especially with the promises of the new president, Vicente Fox—of institutions to hold politicians and the ruling elite to account, reforms to curb corruption, a transparent democracy and socio-economic reforms to reduce massive inequality. Democracy has the capacity to enhance public accountability and deter abuse of power. And so as democracy became consolidated in Mexico, politicians and others in charge of ruling the country would come to realise the risk that abuses would be discovered and penalised, and therefore hold back. In theory. It is not however easy for a renovated democracy to break the vicious circle linking the political culture and the institutions already in place. In an authoritarian regime these generate political alienation, submission and disinformation among the public—ideal conditions for such authoritarianism to be sustained. But while the people used to look at senior functionaries making millions illicitly, and shrug, the tide is changing. And so Mexico has been going through ‘democratic disappointment’, with its citizens, or at least most of them, feeling let down by the new order. Expectations of what democracy can accomplish, politically, economically and socially, are often very high and those who campaign for it raise these to almost idyllic levels. But such aspirations are hard to realise in the short term. The Mexican ruling class has had little need historically to feel concern that it will face regulation and has exercised power arbitrarily, serving its own interests. What probably had the hardest impact on public trust in the new, ‘democratic’ governing authorities was the continuing abuses: corruption, illicit enrichment, use of force against opposition and a plethora of human-rights violations. Felipe Calderon’s election as president in 2006 was marred by allegations of voter fraud and the legacy of his ‘war on drugs’ is still felt: with soldiers carrying out policing duties at local as well as state level, human-rights complaints against military personnel have increased exponentially while security has decreased. The military has failed to hold its officers accountable for well-documented acts of torture and the murder of civilians—but then the military has jurisdiction over all crimes committed by soldiers on active duty. Those in power still act with impunity for their own benefit and the socio-economic situation has not changed. For many Mexicans 2000 appears to have merely changed one corrupt politician for another. Which might explain why, after two consecutive terms of the PAN holding the presidency, the PRI is back. For many, the return of the PRI is a return to old practices. The corruption scandals surrounding the current president, Enrique Peña Nieto, seem straight out of the history books. But while the people used to look at senior functionaries making millions illicitly, and shrug, the tide is changing. Popular reaction to very public cases of corruption and the disappearance of the 43 students in Ayotzinapa have marked a turning point. The rise of human-rights and other civil-society organisations, rallying to demand justice in Mexico, is almost unprecedented. To sustain the momentum and public attention, they must continue to hold the government responsible for its actions—rather than asking it to hold itself accountable and hoping for the best. Never before have citizens had so much power in their hands: to share information, to organise social movements, to develop platforms from which to make public the actions of a governing elite which had for centuries controlled what was said about it. It is up to civil society to create the mechanisms that will curb corruption and bring the change citizens deserve. remind the government that there must always be a balance of power between the governing and the governed, and that as the progress of science increasingly empowers communities and individuals, there will be more and more areas of our lives where—if government insists on behaving poorly and with a callous disregard for the citizen—we can find ways to reduce or remove their powers on a new—and permanent—basis.